Simultaneous interpretation is a relatively recent invention, requiring the use of sophisticated equipment and a high level of advanced education in specific techniques and methods. Because the ability to interpret simultaneously is considered to be both demanding and difficult, it is surprising if not implausible to imagine someone with natural skill interpreting in this way without formal instruction. To understand the advent of interpretation in general, it’s important to understand how language evolved. Although it is impossible to say precisely when language was first invented, Ancient Egypt is home to the oldest references to interpreters. Presumably, interpreters were used once signs and gestures were no longer sufficient, but people still needed to communicate with one another. Interpreters provided services within trade, religious services, the armed forces, and in administrative work. The ancient Greeks and Romans also used interpreters as a matter of course, especially as they rarely bothered to learn the languages of the people they conquered since they considered this to be beneath them. Furthermore, the interpreters used were often slaves and others whose loyalty could not be counted upon. Skipping ahead to the Paris Peace Conference following the First World War, we see the first use of consecutive interpreters as a result of the people’s desire to use multiple languages, and between the two world wars, both the League of Nations and the International Labor Organization were developed which meant many more international meetings and even more languages requiring consecutive interpretation services. These services were provided with a very specific form of shorthand notes and then rendered into the other language, which made the meetings unreasonably long and caused them to lose any sense of spontaneity. Colonel Leon Dostert, a former interpreter for General Eisenhower, was tasked with developing a system for simultaneous interpretation. He looked at the work of Andrea Kaminker who developed his own system for French radio but it wasn’t particularly successful. At the Nuremberg Trials in 1945, which were interpreted into English, French, Russian, and German, the system was different. With this method, interpreters sat right beside the accused to interpret what was said. The entire set of interpreters worked in three sets of twelve each; while Team A interpreted for forty-five minutes, Team B was in the next room, listening in in case of any issues, and to also be aware of the proceedings as they happened. Team C, meanwhile, had half a day off. All of the interpretation and translation services were directed by Colonel Leon Dostert and Commander Alfred Steer. Six interpreters, twelve translators, and nine stenographers worked together for each language. They helped ensure no part of the proceedings was left without translation, interpretation, or transcription services. They helped coordinate these complex language tasks in spite of lacking formal education in simultaneous interpretation techniques or methods, as no formal courses existed for these services. Despite this,services were provided promptly, professionally, and accurately. Participants wore headphones and could pick among the various language channels, depending on their language preference. Simultaneous interpretation revolutionized the interpretation industry, as it allowed the interpreters to convey the information much more quickly, with much more accuracy, and permitted a true exchange of ideas from one person to another, regardless of the language being spoken. This form of interpretation proved so popular that the United Nations adopted Resolution 152 in 1947, which made simultaneous interpretation a permenant service. Consequently, the United Nations provides simultaneous interpretation services among each of their six official languages. Simultaneous interpretation, like language itself, has evolved over the years. 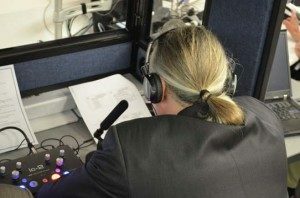 These days interpreters use soundproof booths and portable transmitters, but the basic idea has remained the same – to render one language into another with minimal delay while maintaining professionalism and accuracy. This is absolutely fascinating! I am constantly amazed at how our human mind has managed to innovate through out the ages. Technology is right at our heals providing state of the art equipment to facilitate and help us improve our wondrous skills. Brings to mind that ancient saying, “where there is a will, there is a way”. Thank you so much for sharing! Pauline, thank you for your comment! yes, it seems like every time we think of a new approach for getting something done, technology is right there to help the process along. This proved especially useful for simultaneous interpretation, of course. Even with all the progress, the cost of SI is still prohibitive for a lot of meetings. Most smaller clients don’t want to pay for a booth, technician, mics, receivers, etc. and who can blame them? So we’re still forced to do a lot of consecutive. With all the cell phone technology out now, I’m waiting for a really good, cheap system where I can be in the room, or in another room on my phone with an A/B button similar to the ones in the booth, and anyone who wants to listen can dial in and choose the language they want to hear. We have the technology with conference calls and virtual meetings. Someone should make it happen!